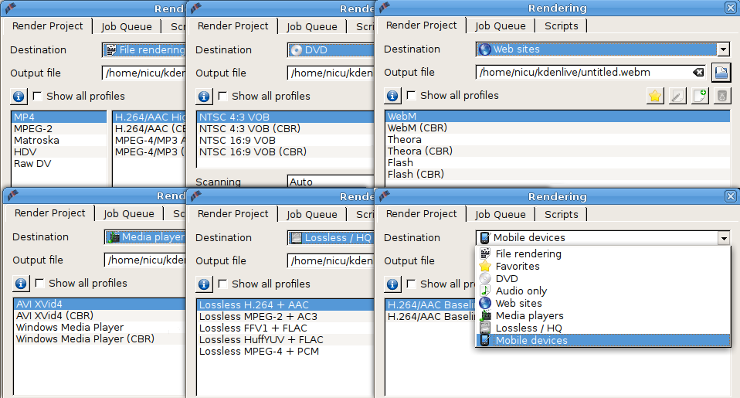 A few years ago I used to regularly publish videos, so back then I started with an evaluation of FOSS video editors available for Fedora. At the time I decided the "winner" to be Kdenlive (at the time PiTiVi was useless, OpenShot unavailable and Blender unknown for its video editing capabilities), despite all the drawbacks of its KDE interface and sudden crashes. Fast-forward, about a year ago, I needed again some video editing, this time for a home project. Not wanting to deal with KDE again (I don't want to flame KDE, I just find a GTK2 interface more friendly to use and GTK apps integrate better in my desktop), I tried OpenShot and it worked good enough. Fast-forward again to current times, after upgrading my desktop to Fedora 21 (from F18, no less!) I needed again a video editing task, I fired-up OpenShot but it refused to cooperate (something related to creating a video clip from a sequence of images, something I used it for before), so back to the old friend Kdenlive again. Yes, Kdenlive can do the work just fine, it just had an unintuitive UI annoyance that had me searching the web to learn where to find a simple option (I was not seeing a tree for the forest). 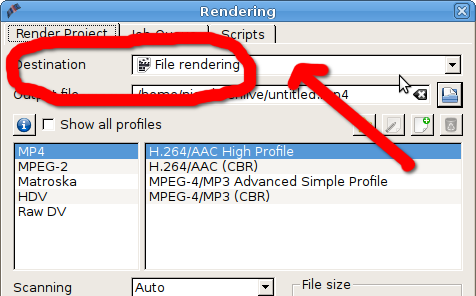 You open the render window and there are not many formats to pick from besides MP4, MPEG-2 and Matroska. Where are the others? Not gone, but hidden behind a "Destination" drop-down. Some other issue that made me lose a lot of time is related to video quality. At first I created a video with the default format, which is MP4 with H.264, which from what I tried later is the thest regarding file size / image quality (didn't try WebM, it isn't useful for my client here, who is the type of person using Internet Explorer on Windows 8, so it has to work OOTB). Then I tried to find a set of settings for MPEG2 or AVI/XVid close to it. No luck! By trial and error (which means rendering the video again and again) I settled for one while the file size is not that large (only ~2.5X time larger) and image quality not absolutely horrible (note: my personal projects always default to WebM).